Set, List and Map are three important interfaces of Java collection framework and Difference between Set, List, and Map in Java is one of the most frequently asked Java Collection interview question. Sometimes this question is asked as When to use List, Set and Map in Java. Clearly, the interviewer is looking to know that whether you are familiar with fundamentals of Java collection framework or not. In order to decide when to use List, Set or Map, you need to know what are these interfaces and what functionality they provide. List in Java provides ordered and indexed collection which may contain duplicates. The Set interface provides an unordered collection of unique objects, i.e. Set doesn't allow duplicates, while Map provides a data structure based on key-value pair and hashing. All three List, Set, and Map are interfaces in Java and there are many concrete implementations of them are available in Collection API. ArrayList and LinkedList are two most popular used List implementation while LinkedHashSet, TreeSet, and HashSet are frequently used Set implementation. In this Java article, we will see the difference between Map, Set, and List in Java and learn when to use List, Set or Map. As I said Set, List and Map are interfaces, which defines core contract e.g. a Set contract says that it can not contain duplicates. Based on our knowledge of List, Set and Map let's compare them on different metrics. The main difference between List and Set interface in Java is that List allows duplicates while Set doesn't allow duplicates. All implementation of Set honor this contract. While a Map holds two objects per Entry e.g. a key and a value and It may contain duplicate values but keys are always unique. See here for more difference between List and Set data structure in Java. Another key difference between List and Set is that List is an ordered collection, List's contract maintains insertion order or element. Set is an unordered collection, you get no guarantee on which order element will be stored. Though some of the Set implementation e.g. LinkedHashSet maintains order. Also SortedSet and SortedMap e.g. TreeSet and TreeMap maintain a sorting order, imposed by using Comparator or Comparable. The list allows null elements and you can have many null objects in a List because it also allowed duplicates. Set just allow one null element as there is no duplicate permitted while in Map you can have null values and at most one null key. Worth noting is that Hashtable doesn't allow null key or values but HashMap allows null values and one null key. This is also the main difference between these two popular implementations of Map interface, aka HashMap vs Hashtable. Most popular implementations of List interface in Java are ArrayList, LinkedList, and Vector class. ArrayList is more general purpose and provides random access with index, while LinkedList is more suitable for frequently adding and removing elements from List. Vector is synchronized counterpart of ArrayList. On the other hand, most popular implementations of the Set interface are HashSet, LinkedHashSet, and TreeSet. First one is general purpose Set which is backed by HashMap, see how HashSet works internally in Java for more details. It also doesn't provide any ordering guarantee but LinkedHashSet does provide ordering along with uniqueness offered by the Set interface. Third implementation TreeSet is also an implementation of SortedSet interface, hence it keeps elements in a sorted order specified by compare() or compareTo() method. Now the last one, most popular implementation of Map interface is HashMap, LinkedHashMap, Hashtable, and TreeMap. Based upon our understanding of the difference between Set, List and Map we can now decide when to use List, Set or Map in Java. 1) If you need to access elements frequently by using the index than List is a way to go. Its implementation e.g. ArrayList provides faster access if you know index. 2) If you want to store elements and want them to maintain an order on which they are inserted into a collection then go for List again, as List is an ordered collection and maintain insertion order. 3) If you want to create a collection of unique elements and don't want any duplicate than choosing any Set implementation e.g. HashSet, LinkedHashSet or TreeSet. All Set implementation follow there general contract e.g. uniqueness but also add addition feature e.g. TreeSet is a SortedSet and elements stored on TreeSet can be sorted by using Comparator or Comparable in Java. LinkedHashSet also maintains insertion order. 4) If you store data in form of key and value than Map is the way to go. You can choose from Hashtable, HashMap, TreeMap based upon your subsequent need. In order to choose between first two see the difference between HashSet and HashMap in Java. That's all on the difference between Set, List, and Map in Java. All three are the most fundamental interface of Java Collection framework and any Java developer should know there distinguish feature and given a situation should be able to pick right Collection class to use. You can also further see, Java Fundamentals: Collections, a free course form Pluralsight by Richard Warburton. Pluralsight offers a 10-day free trial period, in which you can access many more advanced Java courses. It's also good to remember the difference between there implementation e.g. When to use ArrayList and LinkedList, HashMap vs Hashtable or When to use Vector or ArrayList etc. 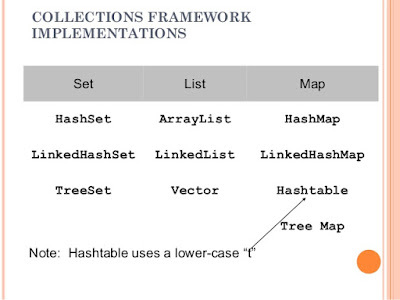 Collection API is huge and it's difficult to know every bits and piece but at the same time, there is no excuse for not knowing fundamentals like the difference between Set, List, and Map in Java. Hope I read this before my interview. Its clear cut explanation.. Really helpful.. Thanks for post. I was asked this question yesterday on a interview and didn't know the difference between Set and Map :( Thanks! Excellent explanation and really helpful for interviews. very well explained!! helped a lot in concept just before interview!! I still find List as a duplicate of Map. Basically, if you set a key value of a given map to a sequence of integers from 0 to n (i-> value_i) it basically represent a List! Is there any reason (memory usage, etc) not to use Map all the times? Using keys instead of integers uses vast amounts of CPU time and memory. Sure @hari, I will write about Queue interface as well. One of the best explaination. Hello Felipe, thanks, that's a mistake. I'll correct this article shortly, thanks for pointing that out. This article is absolutely amazing. It explains all the key features of different collections. I appreciate the time you put to write this awesome post. Can I also get the links of real world example of this collections? So we can compare them side by side.